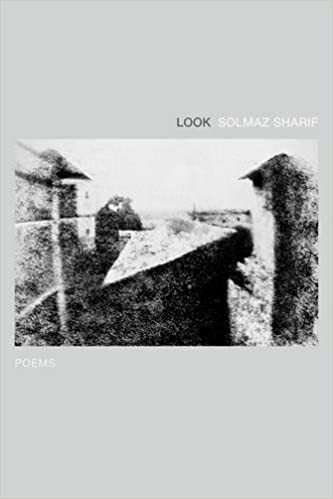 I do not know what to write in response to Look, Solmaz Sharif’s debut collection of poems. Perhaps that is the point. After all, what is one supposed to say in the face of war? In the face of terror? In the face of violence made so familiar that words previously used only in the military have wormed their way into our vernacular with no regard whatsoever for the lives destroyed by the things those words describe? What is one supposed to say in the face of a reality one will never have to know? How can one ignore such violence? Throughout the collection, Sharif utilizes words and phrases from the United States Department of Defense’s Dictionary of Military and Associated Terms, pointing them out by noticeably altering their font, to make clear to the reader from the very beginning how easy it is to slip into military language, and how easy it is from there to forget what “collateral damage” really means. What is remarkable is the way in which, despite the fact that the reader knows right away that certain font-altered words are criticisms of the ways we dehumanize other human beings, the words still somehow become normalized after seeing them only three or four times. There is no escaping this normalization, so the narrator alters the approach: “Reaching Guantanamo” contains no military terms meant to jar the reader, instead relying on the incredibly frustrating to read partially-erased or censored letters to the narrators’ love, Salim. The epistolary poems achieve their desired result, and by the conclusion of the poem, the reader is forced to acknowledge that the narrator’s concerns might be right: “They all say / the same story / and none tell ours” (51). Let me say this one final time: I do not know what to write in response to Look. But I do know there are stories we are not reading or listening to. Stories of pain. Stories of trauma. Stories of violence we are all complicit in. Reading and listening to these stories hurts. But we must read. We must listen. We must learn to sing more children calm, together. Perhaps Look can be a starting point for those of us who have learned to fear opening our eyes.